Oxford Indonesia Society (OXIS) upheld Indonesian official motto “Bhinneka Tunggal Ika” (in English: “Unity in Diversity”) in Oxford, United Kingdom. 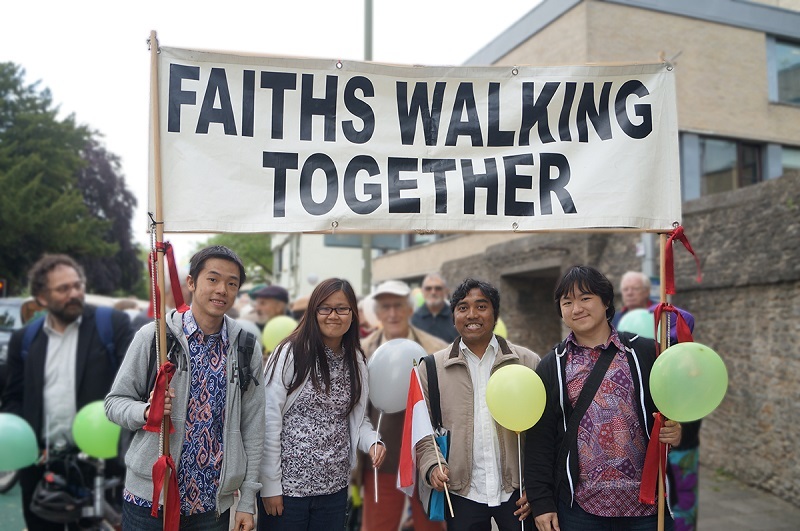 Their participation in the 10th Oxford Interfaith Friendship Walk on Thursday, 13 June 2013 embraced Pancasila (in English: Five Principles), Indonesian official philosophical foundation, in particular the first and third sila (in English: principles). The first sila is about believing in the one and only God, whereas the third sila is about the unity of Indonesia. The evening walk that lasted for two and a half hours brought together more than 500 people believing in various faiths. The 2.1 miles walk started from the Synagogue in Richmond Road, walking via St Giles’ Church, the University Church of St Mary the Virgin, and ending at the Central Mosque in Manzil Way. At each stop, a speech was given, the walkers sang a song together, and a prayer was said. The walk finished with a meal at the mosque. OXIS sent six representatives to participate in the Walk: Desy, Brian, Arnold, Edo, Landry and Mari. The five were students at University of Oxford, except for Arnold who was a student at Oxford Brookes University. 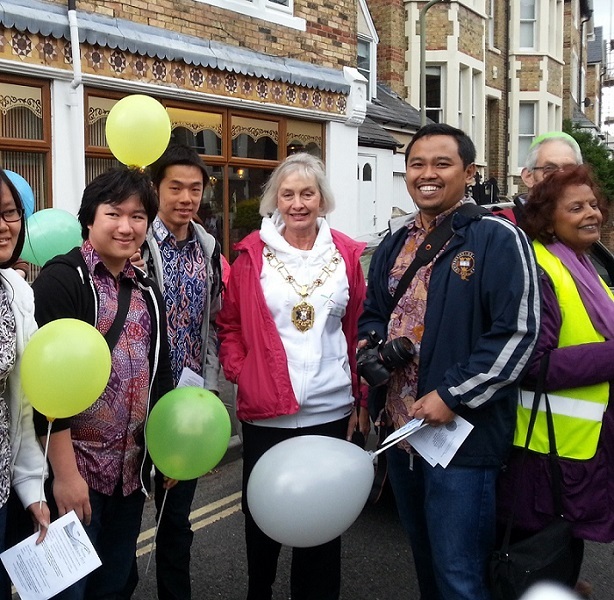 OXIS also had the opportunity to meet the Lord Mayor of Oxford, Councillor Delia Sinclair, and introduced Indonesian Batik to her, which the six of us were wearing. “It was an incredible experience. Meeting Lord Mayor of Oxford was one of the highlights, but the most important thing was that we Indonesians were able to show that Indonesia is a diverse country in terms of religious beliefs yet still respecting other religions and able to unite in peace, just like with these people we are walking together in Oxford,” said Desy Kristianti, the President of OXIS while waving Indonesian flag in pride. One unique tradition of Oxford Interfaith Friendship Walk was that each walker is given a balloon of different colours to bring during the walk, as the colours of the balloons represent the different faiths. In addition to that, OXIS waved Indonesian flag throughout the walk. Arnold and Brian were also eager to hold the “Faiths Walking Together” banner and lead the walk from St Giles’ Church to University Church of St Mary the Virgin, as people had to take turns carrying the banner. Having maintained their national pride, OXIS held their hopes high that Indonesia will continue to be a multi-faith society united as one country, and promise that they will always be proud of Indonesia wherever they go.